The adorable pup was mightily confused after seeing his owner for the first time after his dramatic weight loss. The adorable pup was mightily confused when his owner shed more than 25 kg. Shane Godfrey, from North Carolina, spent five weeks in the hospital after serious complications from flu nearly claimed his life. He lost a great deal of weight during his stay and the new, slender Shane left his beloved four-legged friend Willie mightily confused. 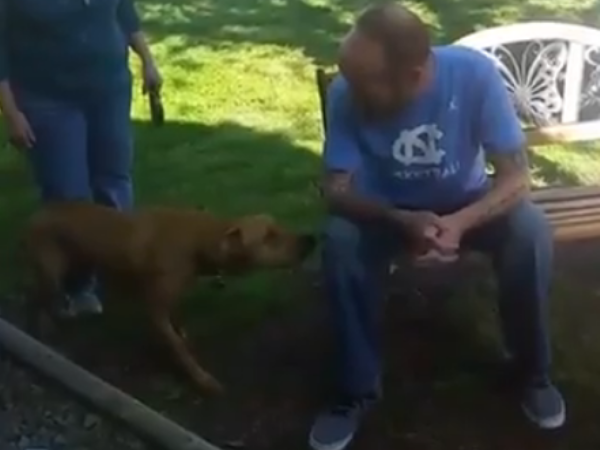 In a video that Shane shared on Facebook, Willie is seen running toward his owner. Before approaching him, Willie’s race to Shane stops abruptly. He stands still for a while, studies the familiar man in blue and takes quick jumps to the front. Eventually, he’s convinced enough to come within smelling distance of Shane and take a sniff. He knows the scent straightaway and Willie is overjoyed as he showers Shane with love. The heartwarming video was later shared on Twitter and within 24 hours had already received more than 57 000 retweets.